The TRD Off-road Package lives up to its name by soaking up big bumps and impressive traction. The allure for big sales gains can undo the decades of a well-earned reputation for a vehicle. Even as the market shifts towards more car-like crossover vehicles, the Toyota Tacoma maintains its focus on off-road capability and top-notch reliability. Those qualities thankfully continue the with the 2018 model though it’s not without compromise. The 2018 Toyota Tacoma gains standard active safety equipment, otherwise remains similar to the 2017. 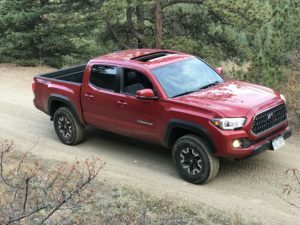 This is the third model year for the third-generation Tacoma which traditionally has had about a 10 year design cycle (typical for the more conservative truck market). It may come as a sticker shock to anyone who hasn’t explored the new truck market recently, but this Tacoma TRD Off-Road and its $45,000 price falls in-line with its competition. There are few creature-comforts missing as leather, adaptive cruise control, blind-spot detection, and premium audio are among the features list while the V-6, six-speed automatic transmission, and rugged four-wheel drive system are also included in that figure. Impressive ground clearance, approach, and departure angles, and flexy suspension are aided by a rear locking differential and low range transfer box. The 2018 Tacoma wears many of its forebears’ distinctive styling traits which includes both advantages and disadvantages. 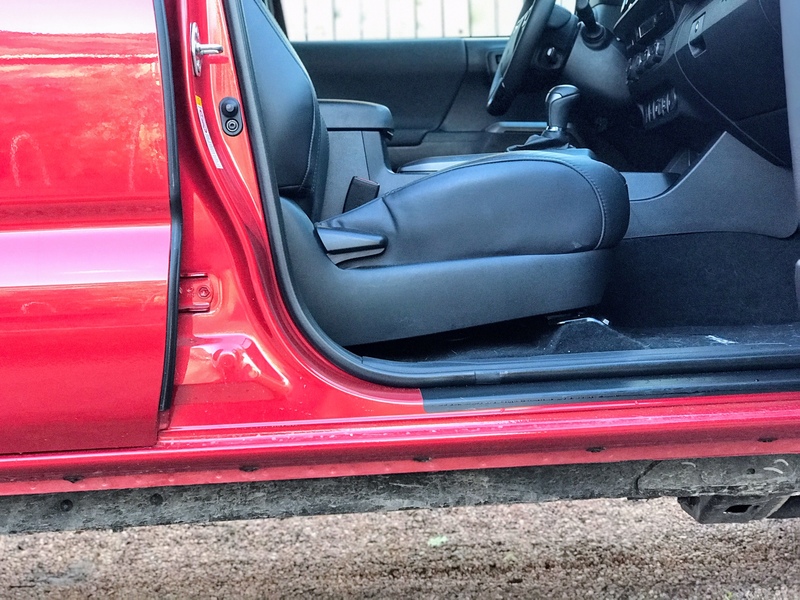 The raised floor enables impressive ground clearance (9.4-inches) but it requires a bit more effort to get in and out of, especially without a grab handle for assistance. The front bumpers are shaped to deliver impressive approach angles though it comes at the expense of fuel efficiency through increased drag. The Chevrolet Colorado Z71 prioritizes reduced drag and slaps a low front air dam to achieve better fuel efficiency though it comes at the expense of off-road capability. 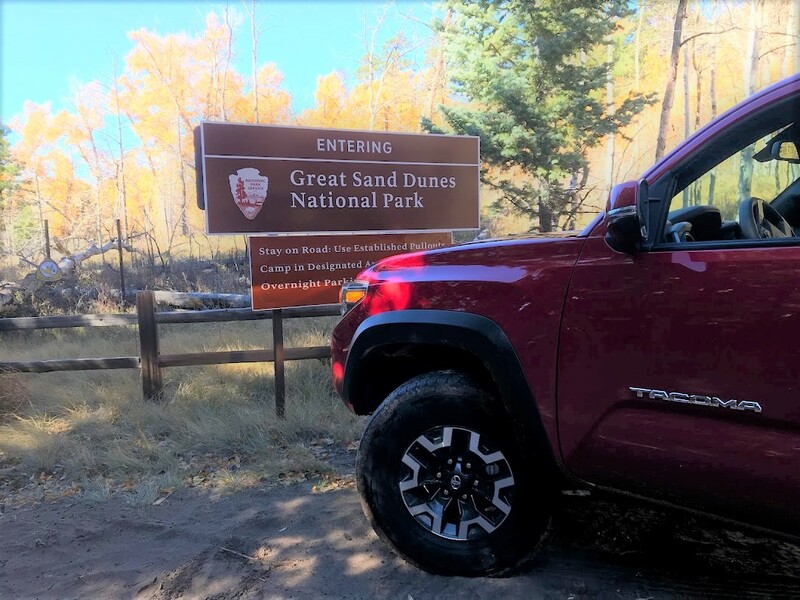 The small wheels (16-inch), large tires (~31-inch), and independent front suspension are great at taking the punch out of potholes and rough trails though on the road there is little steering feel and the truck needs constant steering corrections on the highway. The rear suspension is not as effective at absorbing high speed bumps which is immediately noticeable as it bucks over poorly aligned bridge gaps. Off-road, it produces impressive articulation and soaks up big and quick transitions up to a sane level. Toyota offers the Tacoma TRD Pro with a bit more suspension tuning for improved off-road handling at higher speeds. The Tacoma’s shape, features, and chassis tuning lean more towards the off-road adventure than on-road refinement which is the way it has always been. The interior manages the restrictions of the high floor and low roof line as best it can. Seats are positioned close to the floor to maximize headroom and also making hoping in and out a little easier. A large thick-rimmed steering wheel also helps to get settled. The push button start initiates the welcome screen on the 4.2-inch gauge cluster display which can also provide the vehicle’s tilt and pitch angles. Trying it out, the recommended display limits were on par with my comfort level. Outward visibility is compromised by the long flat hood and the sloping roofline. The instrument panel is upright and features a horizontal layout of its various controls. 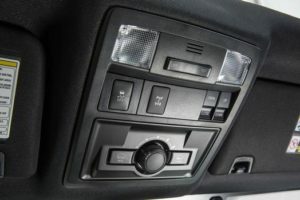 Large HVAC circular vents and a 7-inch touchscreen occupy the top row of the dashboard. The display is nicely integrated and features a sleek volume knob though it’s shallow enough to invite an inadvertent screen selection. The system is quick and responsive to inputs and navigating among the menus is easy but the graphics look ready for an update. Toyota is continuing its roll-out of Apple CarPlay compatibility through its lineup though the Tacoma does without. Still the JBL Premium sound system plays from BlueTooth, USB, Aux, Satellite, and HD Radio and can produce a satisfying kick while feeling like it has even more to offer. The audio quality, however, is always competing with the interior’s rather high levels of noise, vibration, and harshness with significant B-pillar wind noise, engine vibration through the pedal, and engine noise when working hard. The HVAC controls fill out the middle row of the dash and a row of assorted controls fills the bottom row. Panel gaps are consistent and the knobs, buttons, and switches operate with a smoothness and greased-resistance that translates into a sense of quality. Below the dash is a large rubberized tray that easily fits an iPhone 8 Plus and offers Qi wireless charging. Chrome trim pieces are lightly splashed about the interior while a gloss black also covers dials and trim surfaces. Together they accomplish a touch of bling to the otherwise rugged layout. Most of the materials are hard plastic but there is padding where it matters like on the door and center armrest. The rear seat adult passengers may be disappointed if they were expecting sufficient space considering the model’s Double Cab name. Headroom and legroom are in short supply though the rear doors open wide and the rear seats flip and fold to generate a low flat surface. 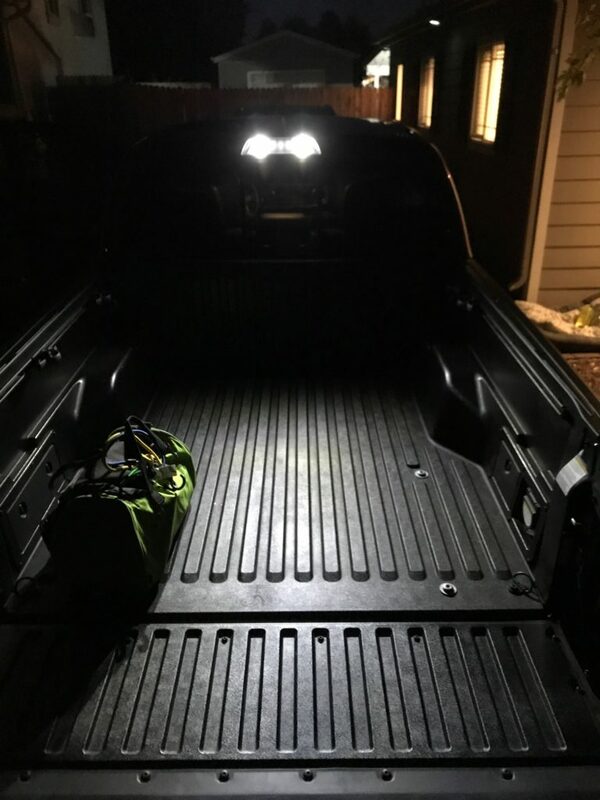 The bed of the truck features a couple of small storage cubbies to relieve the interior of smelly trash or hold small items. 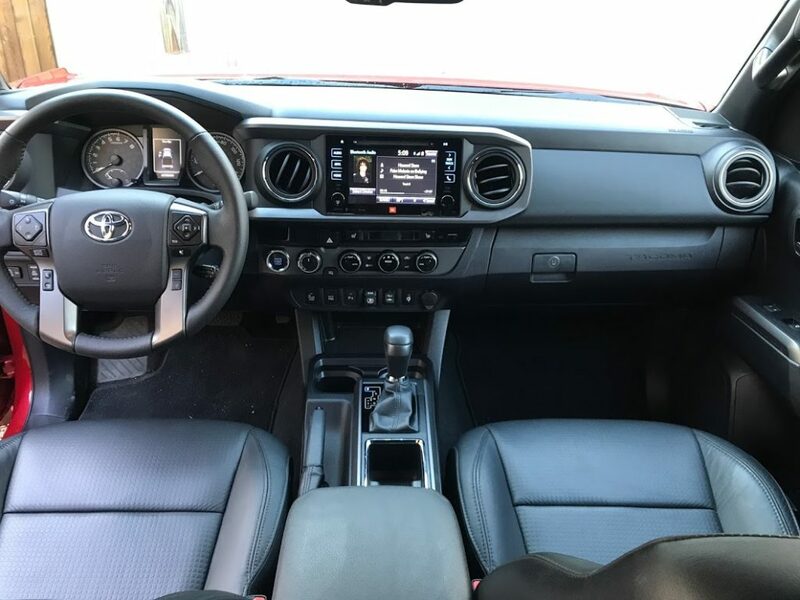 The Tacoma’s body proportions presents challenges to outward visibility and an ideal seating position but the interior’s rugged theme, smooth controls, and rattle-free interior leave an equally lasting positive impression. Powertrain – Better Statistically but Subjectively? The thin air of the Rocky Mountains saps power and exposes the true nature of an engine. 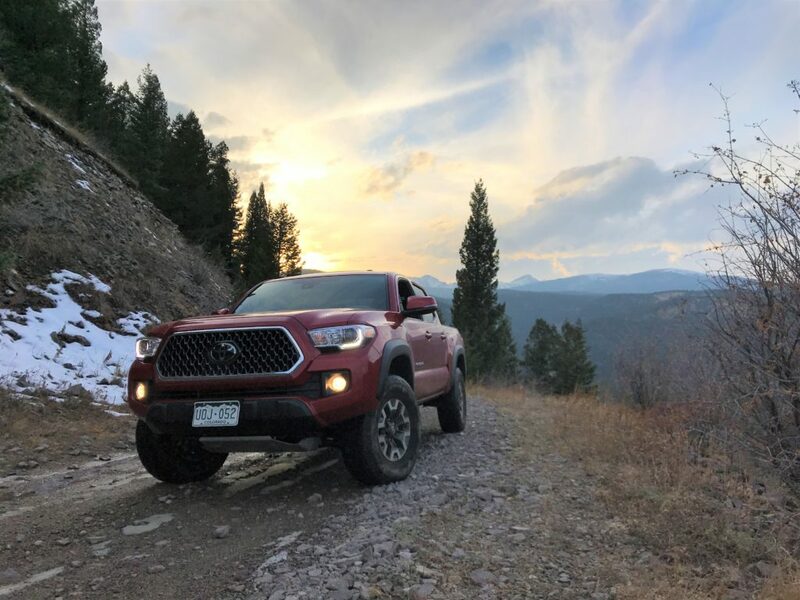 The Tacoma couldn’t find it’s happy place out here in the Denver area, and proved especially unhappy when cruising with the flow of traffic in 75 mph zones. In this situations the battle between power and efficiency is brought to a head where the in-house designed transmission requests a 6th-5th-4th-3rd-gear downshift to achieve the necessary power to maintain the set cruise control speed. The engine’s newfound power gets the Tacoma quickly up to speed and the transmission declares it’s ready to up shift to 4th and to 5th – only to request a 5-4-3 downshift. It is repeatable and along the several mile long hill climbs between Castle Rock towards Denver. A sane person will just turn off cruise control but the powertrain’s uncoordinated effort is surprising from Toyota. The engine is smaller than last generation (3.5-liter vs 4.0-liter) and is equipped with variable valve timing, variable valve lift, and two fuel-injection locations – one directly in the cylinder for high RPM precision and the intake manifold for improved low RPM fuel/ air swirl. It achieves slightly more power than before and about the same peak of torque as before, however, the power delivery could be smoother particularly in first gear around 3,000 RPM where there is a slight surge in acceleration possibly due to the change in which fuel delivery from the dual injector system. The engine’s buzzy feel and sound generally discourage exploring high in the rev range. 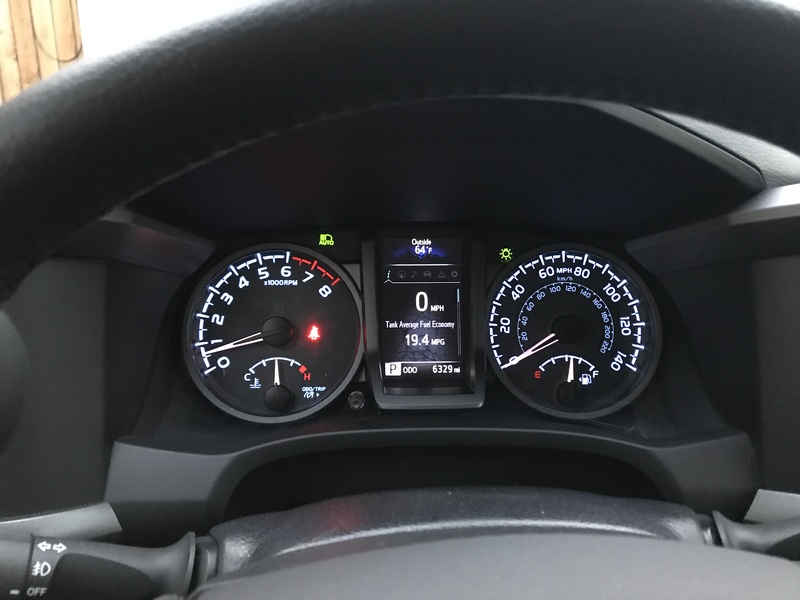 My mixed driving fuel economy figures fell around the 20 mpg mark which aligns with the EPA’s estimates of 19 mpg city, 22 highway, and 20 combined. The four-wheel drive system lacks an Auto mode nor does it feature a center differential that would allow for continued use on dry pavement. This 50:50 permanent power split is advantageous off-road, as is the low-range transfer case, locking rear differential, and four-wheel traction control management. 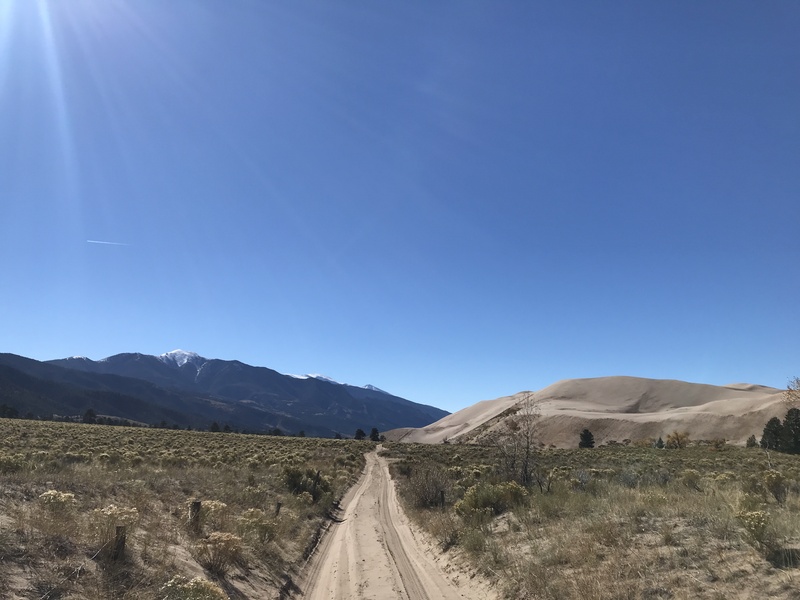 An off-road cruise control is great in theory though when put into action, it can cause the Tacoma to do its best head-banging moment as it accelerates and decelerates rapidly to try to achieve the target speed. Other manufacturers have better executing systems that control though possibly not at the same level of durability or cost. The sand dunes and snow capped peaks from the Great Sand Dunes National Park – just a taste of the many adventures the Tacoma TRD Off-Road will take you on. The off-road friendly suspension limits overall payload capacity (~1,200 lbs) though the Tacoma’s ability to tow 6,500 pounds is impressive for the class. The bed of the Tacoma features a 12-volt power outlet and is made of a resin-compound that will not dent or rust. The upfront cost of the Tacoma may cause folks to reconsider their need for a pick-up and the competition is fierce. The Honda Ridgeline offers similar payload and a 5,000 lbs towing rating while a more refined powertrain and ride make it a much more user-friendly vehicle. The Chevrolet Colorado offers more power and its GMC Canyon sibling offers added luxuries, however, neither has gained the same expected resale value percentage as the Tacoma. The aging Nissan Frontier eschews luxury for simplicity and low-rpm grunt from its larger V-6. The Tacoma maintains its traditional position within the conservative mid-size truck category. It is the off-road capable, rough-riding, and durable pick-up of the segment. It doesn’t take long to figure out the Tacoma’s mission. It seems happiest exploring the trails and while it may put up a fuss on-road, the sense of durability is never failing.